Kids love riding in Jeeps! We'll help you keep your kids safe while offroading, tell you about fun Jeep gifts for children, and share some awesome tips for taking Jeep road trips with your kids. Here's what to pack with kids in the Jeep and where to go. Jeep Dog & Jeep Baby Stuff: A Checklist Of Everything You Need To Pack When Jeeping With Your Dogs… And A Baby! Jeep dog accessories… check! Jeep baby stuff… check! Here’s my checklist of offroad Jeep must-haves when you’re a Jeep family with 1 baby and 2 dogs. Offroad Jeeping with kids and dogs is possible (and enjoyable)… as long as you take these things along! 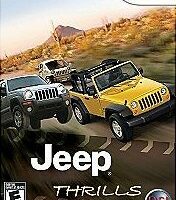 Have You Played The Jeep Thrills Wii Game Yet? I haven’t tried the Jeep Thrills Wii yet myself, but we’re thinking of getting a Wii and the Jeeper in me makes me want to try it. It’s just for fun anyway, right? Plus, my nephew would love it when he comes to visit! Every year, from March through October, Jeep hosts their official Jeep Jamboree events at some of the most beautiful trailheads all across the U.S. Yes, you can bring kids, and pets, and of course friends. Jeep Jamborees feature some of the best Jeep offroading in the US! 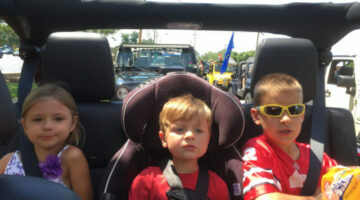 Kids Love Jeeps …Here’s Proof! In case you’re thinking of buying a Jeep… or taking your little one for a ride in a Jeep someday soon… I found some interesting things about kids and Jeeps that you might enjoy. 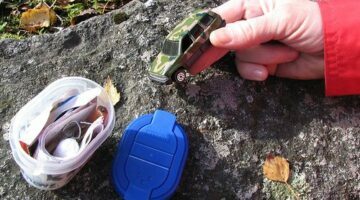 Geocaching: A Game Of Hiding & Finding Hidden Treasures… With Or Without A Jeep! Here’s everything you need to know to find your first geocache, hide your first geocache, and get started Geocaching for the first time. It’s tons of fun. All you need is a little tiny bit of a sense of adventure. Ready… set… find it!